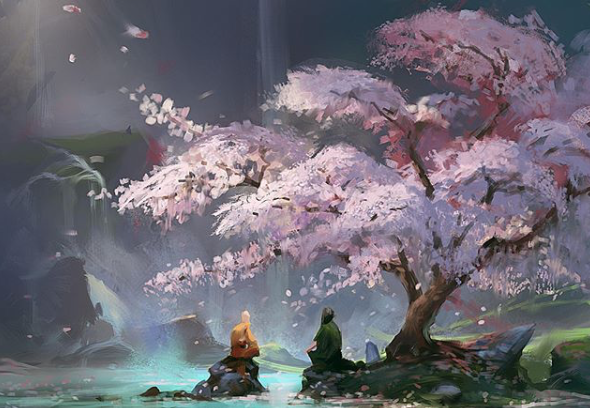 Understanding the rhythm of the game is key to victory in the L5R LCG. That rhythm isn’t obvious to new, or even experienced players, as it goes against everything we’ve learnt about card games up to now. Magic the Gathering (MtG) has been the cornerstone of card games for many years. Despite its age, the initial design concepts by Richard Garfield in 1993 still form the basis for the games we play today. In Legend of the Five Rings (L5R) we still have decks to build, a hand of cards, a discard pile, honor acting like a life counter, and a host of other similarities. While we might bow our Bushi, we really are just tapping creatures. That said, L5R isn’t a clone, even the original card game diverged from Magic in many regards and the new FFG version took advantage of over 20 years of card and board game innovation. One way in which L5R sets itself apart is with the Fate system. In most games, you pay the characters cost and they enter play until they are removed. This results in an increasing board which culminates in a final climactic battle. In L5R, when you pay the cost of character you also pay another cost which determines how long they will stay in play. The game’s designers often mention the concept of Mono no Aware, a complex Japanese concept that is best translated as ‘The gentle sadness of things’. This is why the symbol for the primary resource in the game, fate, is the Sakura or Cherry blossom. The blossoms are beautiful, but only last a week or two. Part of their beauty is knowing that soon they will be gone. Due to this, the Sakura is sometimes associated with the Samurai who strive to have beautiful if often brief lives. The characters in the game are with us for a short but hopefully glorious time. This system changes the growth curve of the board from an increasing curve to something that looks more like consecutive waves. Every turn you create a ‘wave’ and you decide how powerful it is (the height of the wave) and how long it will last (the length of the wave). A powerful wave would be high (your clan champion) but could be brief (no fate extra fate). Alternatively, it could be a gentle wave (a 1 cost character) but could last a long time (5 extra fate). As the resource system is mostly fixed, you gain 7 Fate a turn, each player faces a decision on what kind of wave they want to make each turn. Key point: Each turns investment is split between impact and duration. At the start of turn 1, you have nothing in play and the first wave you create is on an empty Ocean. 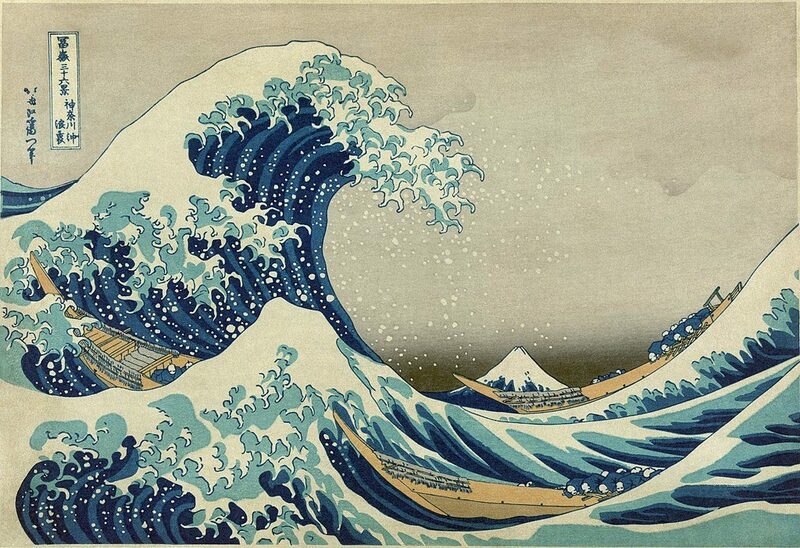 The second, and subsequent waves, all the add to the ripples of the waves before them. If a wave lasts across multiple turns, it ends up adding to multiple waves. So our simple Ocean quickly becomes complex with peaks and troughs. In addition, this is a two player game, and by its nature it has conflict. These opposing waves crash into each other. A player who wins a conflict gets the benefit of a ring effect and if they win by enough as the attacker can destroy their opponent’s province bringing them one step closer to eventual victory. Each player’s wave interferes with their opponent’s leaving one wave (or possibly none) remaining. Key point: Each turn’s investment builds on previous turns, but is countered by the opponent’s investment. Numerous elements play into this, like choosing who to assign to conflicts and what cards from play from hand, but a large part is how a player manages their board. If they break a province with 20 extra skill to spare, they still get the same benefits as if they had just 1 extra skill. As we have limited resources, we want to win conflicts, but not waste resources doing so. Understanding this ebb and flow is key to winning a game. The nature of the game means you will have turns when you are weak and turns when you are strong, but this is also true for your opponent. When you peak, you want to be strong enough to take your opponent’s province but not overextend and waste resources. When you are weak, you want to time it such that your opponent isn’t able to take advantage of it. Key point: Try beat your opponent by enough to get benefit with minimal investment. As unspent fate is not lost from turn to turn, you can choose to save resources for the next turn rather than spending them now. A common strategy that has emerged, especially for the Scorpion, is to play a conservative turn 1 generating a weak wave. Turn 1 is great for this as the opponent will have started with an empty board and has only 7 Fate to work with. This means they are limited in their ability to capitalise on the first turn. As the game progresses, turns where your opponent starts with a clear (or almost clear) board and minimal fate may also open up. A classic opening is a 1 cost character with no fate. This gives you a defending character to help minimise your opponent’s advantage. If they were able to take 2 provinces, you’d be in real trouble, but if they only win a ring or two, it’s not so bad. They will gain an advantage from the rings, but they will lose the resources they spent to do so. Key point: A weak turn 1 is a common strategy. In the second turn, you’ll have nearly twice the resources and can then generate a powerful wave that will last multiple turns. If you’re going into turn 2 with almost twice the usual fate, you’re in a position where you can play powerful characters with multiple fate that will last for several turns. A clan champion costs 5 fate which if made with 2 additional fate would typically clear out your pool. You now have the option of making that champion with 4 extra fate assuring they will be a feature for the rest of the game and still have fate left over for additional actions. This push allows you to build momentum that will last the entire game rather than fade after a turn or two. Key point: A weak turn where you minimise your opponent’s gains, lets you capitalise on a strong next turn. Facing against a deck of this style can be difficult. Do you attempt to capitalise on the initial weak turn or do you mirror and play a weak turn play-style yourself? Currently, it would seem that the best approach is to mirror, as decks that produce a weak initial wave are often able to use their saved resources to rebuff an attack if needed. The optimal turn would be one where you are able to minimize your own spend, maybe making a cheap character, but still take advantage, for example by attacking with Banzai! To prevent you from taking the province your opponent will need to react. Any more than a card or two, however, could leave you overextended and spending more resources than you can off. Your approach then will depend best on what you have in hand. Can you pressure your opponent without over-extending? Key point: Have a strategy for your opponent’s weak turns, if you can’t punish them, then mirror. Attempting to mirror this approach with a deck that isn’t designed to do so can be difficult. This strategy is safer when you have options to play to shift the wave depending on your opponents position. Being able to play characters outside of the dynasty phase can do this, either conflict characters or using other mechanics such as Hidden Moon Dojo. Cards like Banzai! allow you to pressure when you need to. Having character control effects like A Fate Worse Than Death or Mirumoto’s Fury can stall your opponent’s wave. If your opponent isn’t able to capitalise on your weak turn 1, then they will be unlikely to withstand your advantage for the rest of the game. These are all cards most decks are playing already, but it is good to keep in mind. Key point: Conflict characters and control cards allow you to be flexible and adjust to your opponent’s strategy. This article isn’t going to let you change your deck overnight and start winning games. I don’t have any tips on how to exploit this element of the game. Hopefully, the next time you play you’ll notice the waves in motion. You will look back at game and realise where you might have overextended and won a conflict by too much, or a game where you thought you had the advantage but it turned as your opponent suddenly started spending banked fate. Understanding the tides of a game and knowing how to capitalise on them is central to success in this game. The last three big tournaments (Worlds, Pax, and Madrid) were all won by players who understood this and were able to use it to their advantage. Despite the recent changes with the restricted list, and the upcoming Children of the Empire release, the difference between players who understand this ebb and flow of the game and those who don’t will continue to define tournaments success. Very good article. The Fate System is the most difficult to grasp as a new player. Specialy coming from another game. This is a work of art; a pleasure to read.